Having "bees in your backyard" is how stewardship begins. To support bees, you may have plants bees visit, or your neighbors do. You may be lucky enough to have ground-nesting bees on your property. This year I have ground-nesting bees in my own backyard for the first time! The common sweat bees, Halictus. They are easy to see - almost as big as a honey bee and they usually cluster their nests in the same area. Sweat bees are some of the first bees to appear in spring - the first females emerge, mate, and excavate nests. These ground nests will soon become populated with small groups of related females, as newly hatched bees stick around. As a result of the generation overlap, these nests usually persist for much of the growing season. What a treat to watch it unfold! 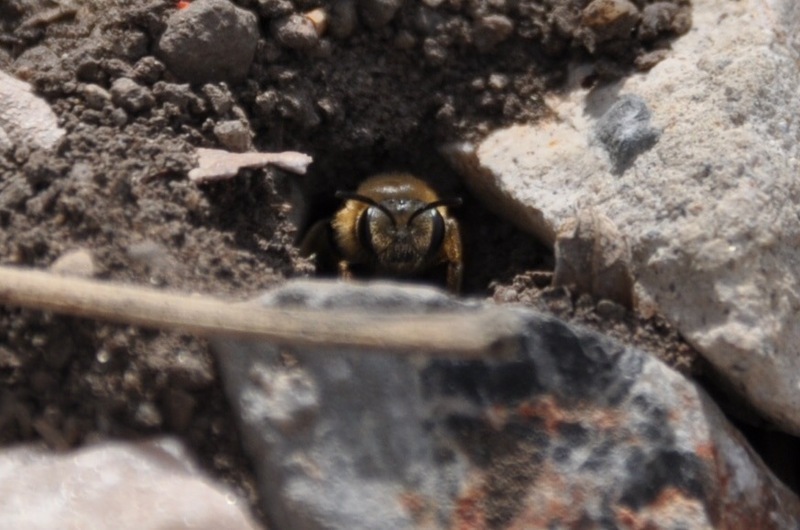 For ground-nesting bees, sunny, relatively bare, and relatively hard-packed soil is apparently preferred. This site has a rocky surface. Rocks are fine as long as the bees can access the soil. It is VERY hard to predict where bees will nest. They just show up. The nests of solitary bees are quite "ephemeral," as they come and go quickly. The life span of an adult bee is only a few weeks, so when a solitary female bee excavates and provisions her nest alone, it is over when she dies. The nest is usually sealed or covered quickly when provisioning is done, or when the solitary females dies. Social and semi-social bees (like sweat bees), by contrast, have nests that last several months due to the generation overlap.